MOSCOW (AP) — With a year to go before Russia’s presidential election, there’s little room for intrigue. President Vladimir Putin is set to glide easily to another term against a familiar pack of torpid rivals — leftovers from past races. But the Kremlin must figure out how to overcome one major problem in Russia’s political environment: public apathy. Putin’s strategists are searching for ways to draw more people to the polls in March 2018 to make his expected victory as impressive as possible. The date of the vote hasn’t been officially set, but pro-Kremlin lawmakers have proposed March 18, the day in 2014 when Ukraine’s Crimean Peninsula officially was declared part of Russia in a move that bolstered Putin’s popularity. Putin, whose approval ratings have topped 80 percent despite a two-year recession, has refrained so far from declaring his intention to seek another six-year term. It’s a familiar course for the Russian leader, who prefers to enter the race at the last moment. The Kremlin’s goal, according to the Russian media, is for Putin to poll 70 percent of the vote with a turnout of 70 percent of the electorate — a result that would represent a majority of the population and prove that his popularity hasn’t withered during his long rule. It’s an ambitious task. Putin polled 64 percent in 2012, with 65 percent of voters casting their ballots, but last fall’s parliamentary elections attracted fewer than 48 percent of voters. The lack of competition has progressively drained public interest in politics, and the lineup of presidential contenders for 2018 can hardly cause any excitement. Lev Gudkov, the head of the Levada Center, a leading independent pollster, said his organization’s polls indicate that Putin could easily win 65 percent of the vote, but that authorities would need other tactics to achieve the 70 percent mark. In 2012, Putin mobilized his support base with anti-U.S. rhetoric. Now, however, he is hoping for a rapprochement with Washington, although such expectations are looking dim amid congressional scrutiny of links between President Donald Trump’s aides and Russia. Gudkov said the Russian public has grown tired of tensions with the West and expects Putin to negotiate a new detente. “A long and dangerous confrontation caused strong public fear of a big war,” he said, adding that Trump’s victory eased those fears and softened a negative public perception of the U.S.
Putin is still riding the wave of patriotic fervor fueled by the annexation of Crimea, Gudkov said, and most Russians still see him as irreplaceable despite brewing discontent over the economy and official corruption. “There are no other real candidates. The political field has been burned out,” Gudkov said. Communist leader Gennady Zyuganov, ultranationalist Vladimir Zhirinovsky and liberal Grigory Yavlinsky have signaled they intend to run. All luckless veterans of many races since the 1990s, they can be expected to campaign in the same stolid, predictable way. To boost turnout, some theorize the Kremlin might allow opposition leader Alexei Navalny to run. The charismatic leader of massive 2011-2012 anti-Putin protests in Moscow has a considerable following among the middle class in the capital and other big cities. His level of support is clearly inferior to Putin’s, but it’s enough to add a touch of excitement to the race. But the Kremlin has seemed to conclude that letting Navalny into the field would be too risky. Last month, a court convicted Navalny in a retrial of a 2013 fraud case and handed him a suspended sentence that bars him from running. Navalny and his supporters say the charges were politically motivated. In the absence of any real rivals, Putin’s political consultants are looking for other attractions to overcome voter apathy. Even though Putin has remained coy about his plans, the appointment of a new Kremlin domestic policy chief was widely seen as a precursor to the campaign. Sergei Kiriyenko, a one-time prime minister and chief of the state nuclear corporation, was appointed to the job last fall. The Kremlin has stayed focused on Putin’s base of blue-collar workers and state employees, burnishing his image as a tough leader who cares for his people and is unrelenting against his foes. 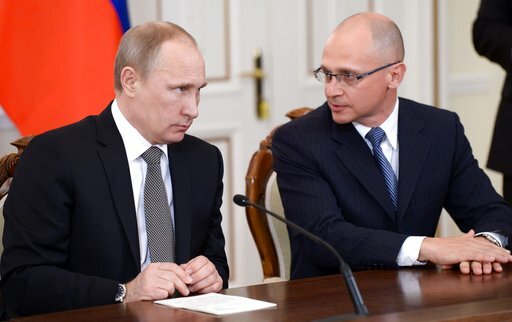 But the appointment of Kiriyenko marked a new effort to reach out to those who have a more critical view of Putin. In an apparent bid to show a gentler face, authorities recently released several people convicted in controversial criminal cases, including Ildar Dadin, an opposition activist jailed for taking part in peaceful protests. The Kremlin even hinted that the draconian law that landed him in prison could be amended. “Voters must receive some political gifts, such as the release of political prisoners, the softening of the regime,” Pavlovsky said. He noted the move should also send soothing signals to Russia’s liberal-minded elite. “It’s not a thaw; it’s the Kremlin games with liberal factions in the business community and the establishment,” he added. The Kremlin also has launched a massive personnel reshuffle to infuse fresh blood into Russia’s corrupt and inept bureaucracy. Several provincial governors have lost their jobs in what was widely seen as an attempt to quell public discontent with unpopular local administrators and rejuvenate the ruling elite. One of the governors named in the past year is Alexei Dyumin, who was appointed to lead the Tula region, home to sprawling arms factories. The rise of the 44-year-old former Putin bodyguard followed his role in directing Russia’s special forces during the annexation of Crimea — the act that earned him the country’s highest medal. Dyumin’s quick promotion and the unusually strong coverage of his activities by state TV have led some commentators to speculate that Putin could be grooming him as a potential successor. Pavlovsky said the appointment of new governors, some in their 30s, is also intended to encourage a new generation of public servants. “It’s a signal to young bureaucrats: Wait a little and you also will go up, your careers will grow,” he said. Russian media reported the Kremlin apparently hopes to generate interest in the election by emphasizing it would be Putin’s last under the constitution that limits the president to two consecutive six-year terms. “The aim is … to create a feeling of intrigue and uncertainty regarding the nation’s future,” wrote Tatyana Stanovaya of the Center for Political Technologies think-tank. Putin served two four-year presidential terms from 2000-2008 under the old law before shifting into the premier’s seat for four years in line with the constitutional limit. His placeholder as president, Dmitry Medvedev, oversaw the presidential term extended to six years before stepping down to allow Putin’s comeback in 2012. If Putin serves another six-year term, his two decades in power would make him the longest-tenured Kremlin leader since Soviet dictator Josef Stalin, who ruled for 29 years. Pavlovsky said the plan might help raise the turnout, but it could also trigger an early succession battle among Putin’s lieutenants, eroding stability. Iulia Subbotovska and Veronika Silchenko contributed to this report.